On January 30 of this year, you may have noticed a certain bespectacled figure serving as the Google Doodle: Fred Korematsu. Possibly unknown to many of you (In fact, I didn’t know the name until several days prior to his being honored by Google), Korematsu was nonetheless an important civil rights figure of the 20th century and has gotten the recognition he deserves as in recent years, with Fred Korematsu Day being celebrated in several states. Now, younger readers are offered an informative look at his fight for justice. Co-written by Laura Atkins and Stan Yogi, Fred Korematsu Speaks Up documents the journey of the man who fought against the forced relocation of Japanese Americans to prison camps during World War II. The book provides details about Korematsu and his battle, but also about social movements and other groups that have suffered enormous discrimination, such as African Americans and Chinese Americans. Much of Korematsu’s life story is told in poem-like stanzas, starting with an incident as a young man in which he was refused a haircut at a barbershop because of his race. Atkins and Yogi then take readers through significant moments in his life, from the personal (such as how Korematsu came to be known as “Fred”) to monumental events for the Japanese American community (like the bombing of Pearl Harbor and President Franklin D. Roosevelt signing an executive order authorizing the military’s removal of people of Japanese descent from their homes on the West Coast). Not surprisingly, most of Fred Korematsu Speaks Up is devoted to his life as a prisoner (Korematsu and his family were forced to inhabit a horse stall), his struggles in a racist society (he was unable to marry the love of his life in California because the state prohibited interracial marriage at the time), and his protracted legal fights (he was arrested because he refused the government’s order to relocate to a prison camp). Korematsu’s case eventually reached the Supreme Court, though it was unfortunately ruled to be legal for the government to forcibly remove Japanese Americans from their homes. However, roughly 40 years after that setback, with the help of his new legal team (who discovered the government’s lies that resulted in so many Japanese Americans being locked up), Korematsu won a significant victory: a federal judge overturned Korematsu’s conviction for refusing to report to prison camp. 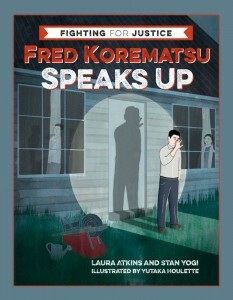 Although their work was titled Fred Korematsu Speaks Up, as mentioned earlier, Atkins and Yogi devote a lot of time to educating younger readers about American history, especially civil rights movements. A timeline appears in the book, documenting important events in U.S. history and Korematsu’s life of interest to aspiring activists. As the book is very much for pre-teens, it’s best to remind yourself that authors aren’t talking down to you when you see terms such as government, law, loyal, and spies defined. But readers of all ages might find definitions of other terms appearing in the book like issei, nissei and Empire of Japan useful. 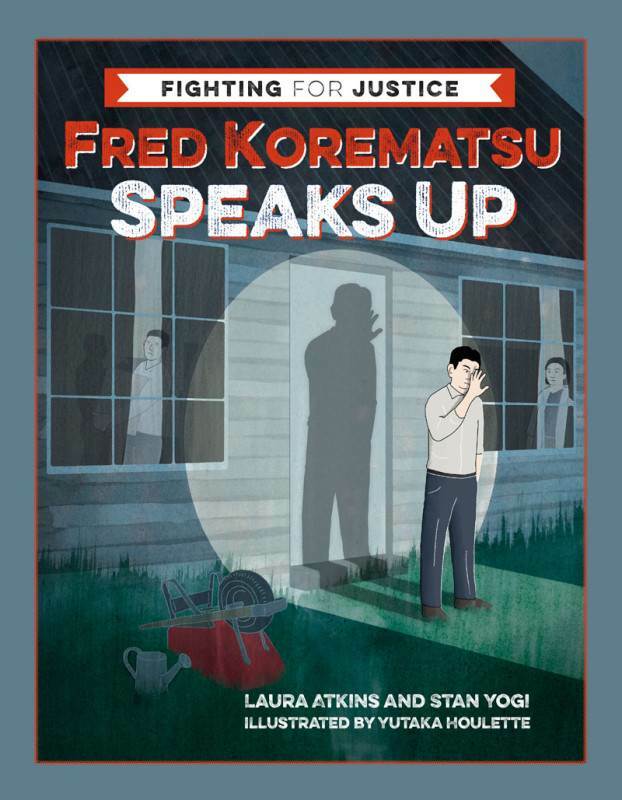 Most of all, it’s clear that Fred Korematsu Speaks Up serves as a call to action for young readers (the book is part of a series released by Heyday Books titled Fighting for Justice that introduces readers to prominent social justice activists). A section of the book is devoted to providing advice to young activists about how to be a force for good and contains information about organizations that could be of assistance for those fighting to improve their world. Fred Korematsu Speaks Up isn’t just a valuable read for young people. Those unfamiliar with Japanese American history might be shocked at the virulent racism members of the community faced (the book includes photographs of signs with racist slogans about Japanese Americans). Some useful information for readers is omitted—on one hand, the timelines display information about events such as California passing a law prohibiting issei from owning land and the U.S. government stopping Japanese immigrants from entering the county, while on the other hand, there was no information about how those laws were overturned. Still, the authors provide plenty of facts that illuminate a tumultuous period of American history and present the crucial figures that fought to obtain justice for Japanese Americans imprisoned during World War II. And quite appropriately for the age group the book targets, Fred Korematsu Speaks Up features several photographs and drawings that document the brutal conditions that many Japanese Americans endured during their internment. In short, Atkins and Yogi have composed a simple but heavy and incredibly (considering current events) timely read. While older readers should probably find additional materials to supplement their knowledge of the Korematsu case and Japanese American internment, Fred Korematsu Speaks Up skillfully introduces a civil rights icon and other brave men and women to a new audience. JQ readers can get 30% off Fred Korematsu Speaks Up with checkout code JETALUMS from www.heydaybooks.com.